Mega Raichu in game: 175 Who? Important notice! Pokemon Mega Raichu is a fictional character of humans. 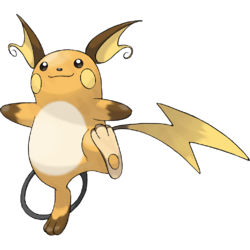 Raichu is a bipedal, rodent-like Pokémon. Raichu is covered in dark orange fur with a white belly. Its bifurcated ears are brown on the outside, yellow on the insides, and end in a distinctive curl. There are circular yellow markings on its cheek where its electric sacs are, and it has a triangular, dark brown nose. Its arms and feet have patches of brown fur at the end, and the soles of its big feet are tan with a circular orange pad. On its back are two horizontal brown stripes. Its long, thin tail has a lightning bolt-shaped end. This lightning bolt is smaller on females. The tail is used to gather electricity from the atmosphere, or it can be planted in the ground to search for electricity. Its tail also serves to protect itself from its own power. 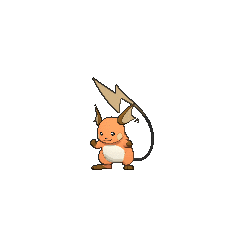 Raichu exudes a weak electrical charge from all its body and slightly glows in the dark, and is capable of storing over 100,000 volts of electricity. However, it will become aggressive if it has stored too much electricity. To keep from reaching this state, it discharges electricity through its tail into the ground. This leads to scorched patches near its nest. If Raichu’s sacs are fully charged, its ears will stand straight up and its muscles become stimulated. Raichu is found in forests and woodlands. Like the two others in its evolutionary family, Raichu is able to learn Volt Tackle as a signature move. In Alola, Raichu has lighter coloring and more rounded features. Its eyes are blue with yellow half-circles along the bottom. It has large yellow ears with an inner spiral toward the base and brown on the inside. These ears are thicker and less pointed than a standard Raichu’s ear. 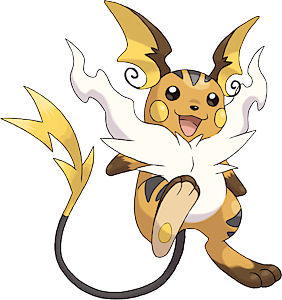 In addition to its white belly, Alolan Raichu has white markings on its paws with bright yellow lines between its digits. The stripes on its back have also turned white, and there is a small, white circular marking on each heel. The lightning bolt-shaped tip of its tail has rounded edges. By collecting its psychic power in its tail, it is able to ride it like a surfboard and float in the air. While its cheek sacs are still used to store electricity, rubbing them releases a sweet aroma. This is also thought to be connected to its psychic abilities. Raichu's transformation in Alola into Alolan Raichu is a mystery, but the natives suppose that maybe it ate too many sweet, fluffy pancakes. 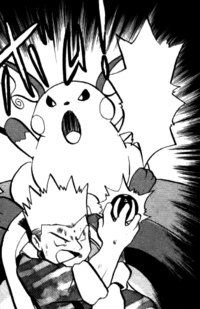 Lt. Surge, the Gym Leader of Vermilion City, has a Raichu that defeated Ash's Pikachu with its sheer power in Electric Shock Showdown. After discussing evolution with Pikachu to match Raichu's power, Ash used a strategy relying on Pikachu's speed to defeat Raichu the next day. Raichu was one of the four Pokémon causing trouble for Pikachu and co. in Pikachu's Vacation, along with Marill, Snubbull, and Cubone. In Lights, Camera, Quack-tion, a girl named Katrina decided to use her Raichu in the Cleavon Schpielbunk film "Pokémon in Love". Stage Fight! was about a stage show that featured "talking" Pokémon. Kay's Raichu was supposed be a part of these shows, but it had stage fright. A Raichu named Sugar appeared in Cooking Up a Sweet Story. It evolved from the restaurant owners' missing Pikachu. Another Raichu appeared in Pika and Goliath!, owned by Sho. It battled against Ash's Pikachu twice in that episode. The Pokémon Summer Academy has a very skittish Raichu for its students. It appeared in Camping It Up! where it was trained by Ash. Another Raichu appeared in Flint Sparks the Fire! and The Fleeing Tower of Sunyshore! under the ownership of Volkner. A Raichu appeared in Good Friends, Great Training! and Valuable Experience for All! under the ownership of Tierno. An Alolan Raichu debuted in SM013, under the ownership of Noa. A Raichu also appeared in Pokémon Fashion Flash, Mewtwo Strikes Back and Pokémon Double Trouble. Multiple Raichu also appeared in The Power of One. A Raichu was seen herding Mareep in Mild 'n Wooly. A Raichu was one of the Pokémon seen at the Pokémon Swap Meet in Tricks of the Trade. A Raichu appeared in Beauty and the Breeder where it participated in a Pokémon breeding competition. Raichu made a cameo in The Legend of Thunder!. It was one of the Electric Pokémon that were lured by the "Miracle Crystal" that Attila and Hun were using. Raichu tried to be the hero by zapping the crystal, but the attack bounced back to itself. Raichu is one of the Pokémon that were affected by the crystal in As Clear As Crystal. A Raichu appeared in Deceit and Assist under the ownership of a Pokémon Coordinator participating in the Hoenn Grand Festival. Another Raichu appeared in Sticking With Who You Know!, falling in love with a Squirtle due to the effect of Professor Kodama's machine. 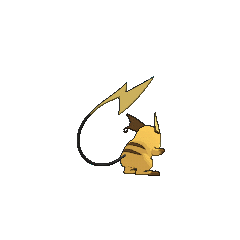 A Raichu appeared in a fantasy in To Catch a Pokémon Smuggler!, evolving from a Pikachu using a Thunder Stone. 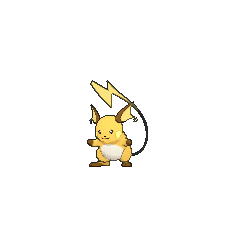 A Raichu appeared as a silhouette in SM003. Lt. Surge has a Raichu in Pokémon Adventures, which was first seen in Silph Co. in Go for the Golbat but never participated in battles until fighting the Masked Man in his Mahogany Hideout, where it helped Surge break in and seemingly backed the mastermind into a corner, until his Houndour called upon dozens of wild Houndour to thwart Surge, instead. The former Team Rocket triad member barely escaped with his life after having many of his Electrode self-destruct. 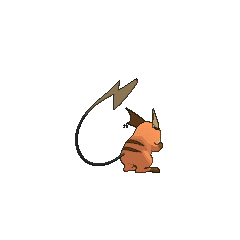 In The Last Battle XIII a Raichu was one of the Pokémon sent to help the fight in Ilex Forest. Volkner has a Raichu which he used it in his battle against Platinum in Encountering Elekid. Alolan Raichu is likely based on the concept of surfing Pikachu and the sport of surfing itself, which originated in Hawaiʻi. Its design appears to have been influenced by Puka, a surfing Pikachu that appeared in the anime. In the Pokémon Stadium series, Raichu rides on its tail when using the move Surf.